I’m knitting! I have finally been inspired to start on a new sweater for John. I don’t know if you remember but in February (yeah, that long ago! 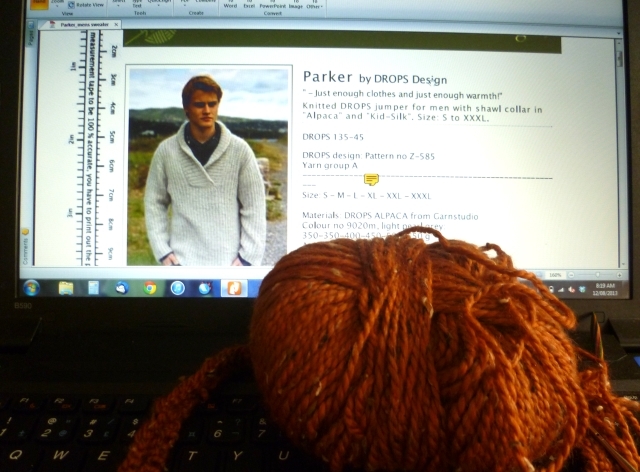 ), I bought a bag of yarn to make a sweater. John chose the colour, I chose the weight (heavy worsted) and I tried to come up with a design that I was happy with, that he would like. Well, that was a dismal failure. 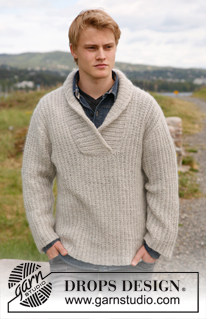 Then, Saturday, I was looking at men’s sweaters on the Drops website (garnstudio.com) and came across this one. Knowing John’s tastes, I had him look at it; his immediate comment? “I love it!” Yup, I figured he would. He likes his sweaters loose and comfortable, casual and yet classy. After that easy decision, it was time to swatch and swatch again. Earlier, I’d swatched with two different needle sizes, 4.5 mm and 5.0 mm. Now it was time to swatch in pattern. Well, colour me happy! On a 5.0 mm needle, the swatch worked out perfectly. I’ve now cast on and I’m on my way…. I’m knitting again!